I'm pleased to announce that my team has put the finishing touches on what I think is the most comprehensive documentary project we've ever undertaken here at Mauldin Economics. In our new film, called Why Bitcoin Matters, my team and I investigate what Bitcoin is today, and also what it could mean for the future of money. As you'll see, we focused less on the fascination over speculating on Bitcoin's wild up and down swings and more on what the technology itself represents for the world of tomorrow. Barry Silbert, for example, founder of SecondMarket and the Bitcoin Investment Trust, speaks about what Bitcoin-associated technologies could do to the remittance business, and how Bitcoin could decimate companies like Western Union and MoneyGram. Mark Yusko, CEO and CIO of Morgan Creek Capital Management, talks about what intrigues financial institutions about Bitcoin technology, and what growing venture capital interest in Bitcoin could mean for Silicon Valley's plans for the technology. You'll also hear from Mauldin Economics Chief Strategist Worth Wray, my friend and frequent dinner companion George Gilder, and Steven Lord of the Modern Money Letter. Why Bitcoin Matters shows you what a "block chain" is, what it means to "mine" bitcoins, and what Bitcoin could do to real estate, account security, money transfer, and a host of other industries. 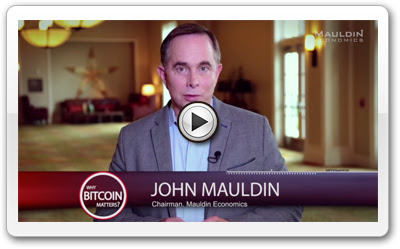 You can watch Why Bitcoin Matters (it runs less than 20 minutes) right now by clicking here. If you like the film, I encourage you to share it with friends and colleagues. The more people watch and respond to Why Bitcoin Matters, the faster the next wave of innovations will take hold.